If you need a prom tux rental in Northeastern Pennsylvania, look no further than Tuxedo Junction. We have a variety of designer tuxedos available that are perfect for every style. Whether you want to stick to the traditional black, or branch out to gray or navy, we have it all. We can also match any dress color, so you and your date will have those picture-perfect photographs of your special night. The beauty of a prom tux rental is just that–it’s a rental. After the night of dinner, dancing, and fun is over, you won’t have to worry about storing any more clothing. The likelihood of wearing your prom tux again is slim so, instead of investing all that money into buying one, go the easy route and rent a tux instead. Prom is only one night, and your style preferences are likely to change the next time you need a tux. 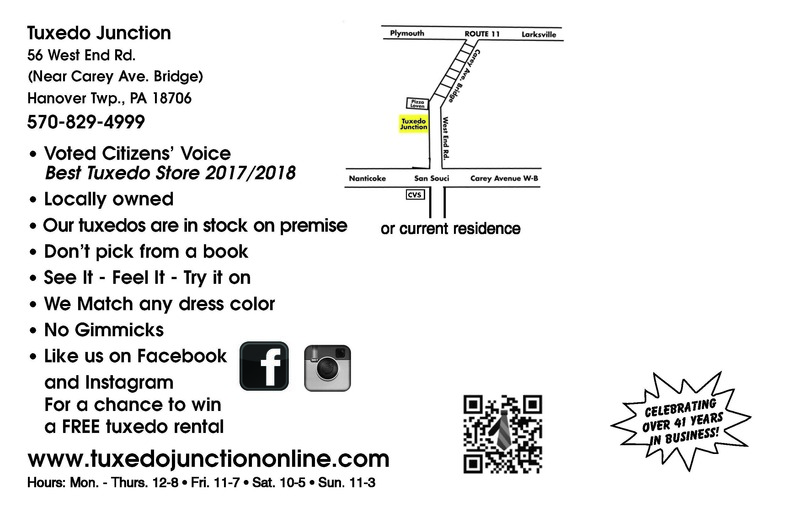 Come on in to Tuxedo Junction to see all of our discount designer tuxedos in person and try them on for yourself.